I’m seeing some widespread misconceptions about the relationship of unemployment rate and consumer confidence to recessions. Below is a chart that sheds light on this historical relationship followed by a few brief comments. 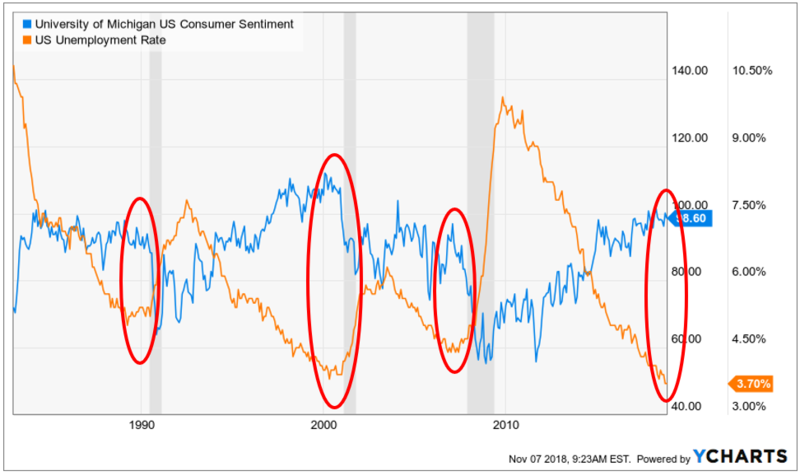 Since 1982, we notice that the unemployment rate tends to bottom immediately before the official start of recessions while consumer confidence tends to peak and then begin rolling over just before recessions. With 3.7% unemployment, it’s not likely the unemployment rate is able to decline much more. Meanwhile, consumer confidence is near an all-time high and higher than it was at the late-1980s and 2007 peaks. Recessions are not officially “called” until well after they begin. On average, the National Bureau of Economic Research “declares” recessions 6-9 months after they start. Many folks are claiming that a recession can’t start in the near future because GDP is reflecting strength. However, below I provide a chart from Dr. John Hussman showing the highest GDP growth rate and the lowest unemployment rate within the two quarters immediately preceding recessions. 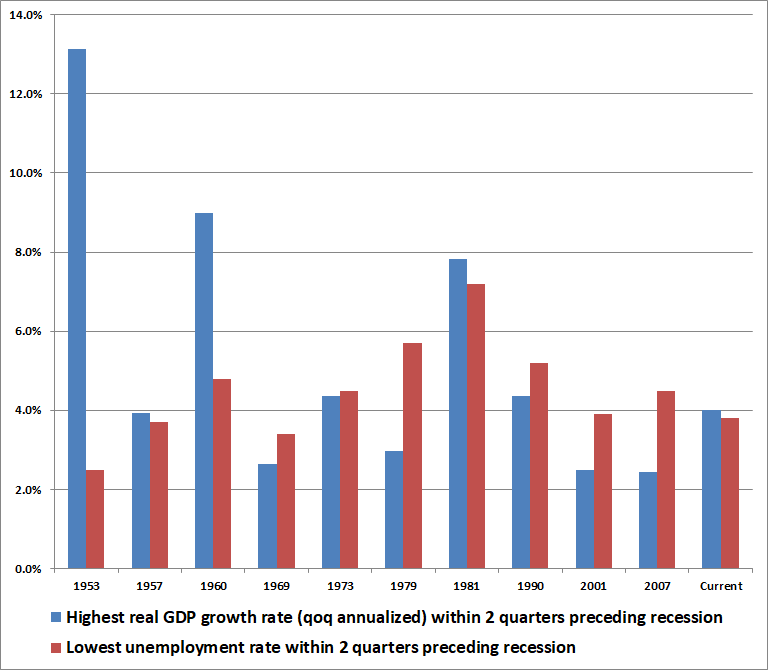 As we can see, GDP growth and unemployment can look very strong just before a recession and deteriorate very quickly. Stocks tend to anticipate economic data so by the time a recession is officially declared, stocks are usually already well off their cycle peaks. In 2001, the stock market was already down 25% from its peak by the time the recession officially began March 2001 (not even officially declared until after that point). In 2008, the stock market was already in free fall by the time (June 2018) the NBER declared the recession started in December 2007. So even if a recession is 6-12 months off, the stock market will likely anticipate it well before the recession begins. Past performance is no guarantee of future results. This is NOT investment advice but general education. Next PostNext The Most Misleading Chart in Finance?